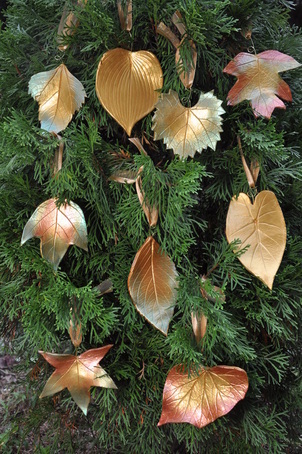 Leaves and flower petals are pressed into an air drying clay, then hand painted with a metallic paint. 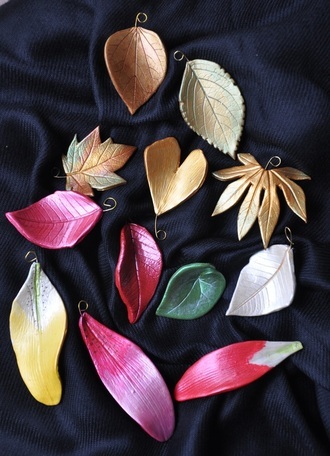 Leaf and flower ornaments include a ribbon for hanging on your tree or around your home. Leaf and flower petal pins, pendants and barrettes. The Ornaments page has available ornaments for sale. Click above photo for link. The Jewelry page has available pins and barrettes for sale. Click above photo for link. I have had so many wonderful responses to your leaf ornaments given as Christmas presents.Your leaves are hanging on trees all over Columbia and beyond.